Union Minister for Law and Justice Mr. Ravi Shankar Prasad on Monday addressed a press conference on the key initiatives taken by the Government during the four years that it has been in power. 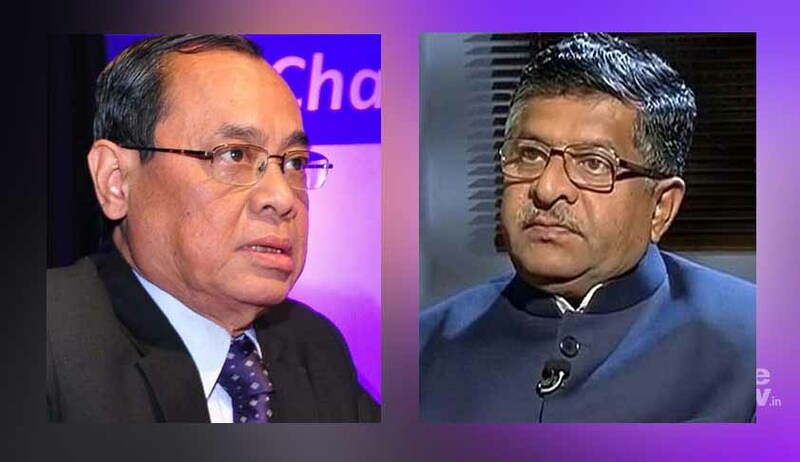 Speaking to the gathering, Mr. Prasad clarified the Centre's stand on the appointment of Justice Ranjan Gogoi as the next Chief Justice of India (CJI), saying there is no reason to doubt its intention. Questions over Justice Gogoi's appointment as the next CJI cropped up following the unprecedented press conference held by four sitting Judges of the Supreme Court in January this year. When asked about the same during the conference, Mr. Prasad responded, "As far as the next CJI is concerned, the convention is clear. The sitting CJI would forward the name of his successor. When the name does come to us, we would discuss it. But there is no reason to doubt our intentions." With the Supreme Court's attempt at introducing a central selection mechanism having been pending for over a year, Mr. Prasad reiterated his suggestion for setting up a national-level entrance exam for judges of the subordinate judiciary. He said, "It is very important that there is an infusion of talent in the subordinate judiciary. I am very keen on boys and girls coming from National Law Schools on taking that examination...I am very keen on marginalized communities getting a representation in the subordinate judiciary... It is a work in progress. We don't want to encroach upon the autonomy of the High Courts as long as subordinate judiciary is concerned. All those who are selected would work under the High Courts concerned. But there is a compelling need for such examination, so that the best talent can come." Mr. Prasad, during a PowerPoint presentation played during the conference, asserted that "the triple talaq bill has been designed for gender justice, gender equality and gender dignity." When asked if the Government was planning to take the Ordinance route on the Bill, he appealed to the opposition parties to address the issue on triple talaq by looking beyond the political divide. He said, "We will pursue the Bill in all earnestness. I take this opportunity to appeal, in particular, to Soniaji, Mamataji and Mayawatiji, who are influential women leaders, that on the issue of triple talaq, they need to go beyond the political divide." On the pendency of the National Litigation Policy, Mr. Prasad asserted that a "very important structural change" was going to happen as far as Government litigation is concerned. He said that the Government would try to minimize Government litigation. "If there exists a dispute between two Governments, the Secretaries would sit together and try to sort it out. If this doesn't help, the matter will go to the Cabinet Secretary, and his decision will be final," he explained. With regard to the pendency of the Memorandum of Procedure (MoP), Mr. Prasad asserted that while he cannot go into the details of the same, his vision of it was that "norm of screening of a possible candidate should also be laid down in the MoP itself." "Using technology to speed up delivery"
During his address, Mr. Prasad appreciated the "Digital India campaign", asserting that it actually meant "digital inclusion". He asserted that the Centre's record in terms of improving judicial infrastructure and appointments has been "exemplary", adding that while appointments have been restricted to a little over 70 every year for the past few years, the present Government appointed 126 judges in 2016, 115 judges in 2017 and has already appointed 34 judges in 2018. The presentation played during the conference elaborated on the improvements in judicial infrastructure during the past 4 years. Apart from the Court buildings built during this time, he informed the gathering that the number of Fast Track Courts had also increased from 281 to 727. 12 Special Courts in 11 States have also been set up for dealing with criminal cases concerning MPs and MLAs, he said. Besides, Mr. Prasad spoke about the introduction of the "justice clock", which would incentivize quicker disposal of cases by displaying the names of three district courts which top the list of disposing cases before them. The funding to NALSA, he also informed, has been increased from 34 crores to 91 crores, which he claimed led to a 672% increase in the average number of cases disposed of by Lok Adalats per year. He concluded by asserting, "We have used technology to speed up delivery, and to assure accountability."